The concept of the empty bowl events is just amazing…really, somebody thinking outside the box. Every community does something a little different: http://www.emptybowls.net/, but the idea is to help feed people in need. 1. It’s for a great cause. 2. 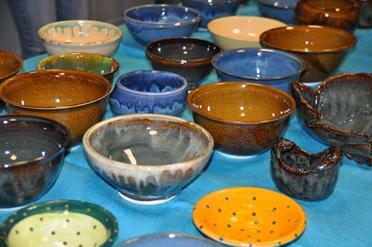 You get to choose from beautiful stoneware bowls that were hand made by students, faculty and community members. 3. Live music. The Nashua High South Jazz band will be playing. 4. You get to sample from lots of great soups made by area restaurants. What a fantastic community event that benefits the Nashua Soup Kitchen. This entry was posted in Babble, Interesting Bites on NH Towns and tagged benefit, empty bowl, high school band, nashua high, nashua high south, nashua nh, soup kitchen by Jennifer Cote. Bookmark the permalink.